Feel like your planet has been nuked by technology you created and the entire human race is on its last legs, finding new ways to both argue and get along in the vast black distances between stars? Bummer. Want to party anyway? 13th Colony-Vancouver’s Battlestar Galactica Fan Club, is hosting a room party at VCON, our homegrown sci-fi convention, on the night of Saturday, September 29th. VCON 37’s theme this year is Post Apocalypse, and BSG definitely fits in with that category. The con is taking place at the Sheraton Guildford in Surrey. The exact location for the party will be posted around the convention on the day of the party. We will have snacks and drinks in the theme of BSG, and promise only that everything we find will taste better than algae! 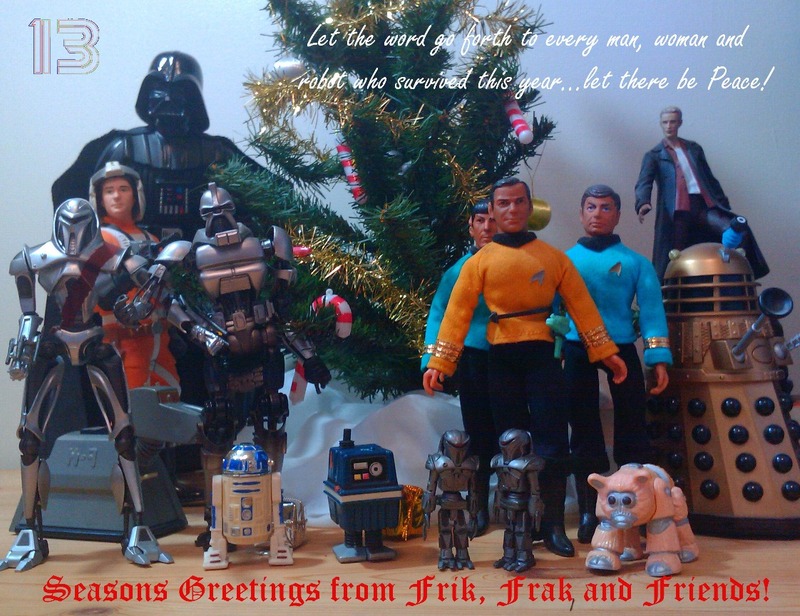 Merry Frakkin’ Xmas to All! Finding shooting locations for the re-imagined Battlestar Galactica TV series in and around Vancouver has been a favourite past time of 13th Colonists for a few years now. Having inspired a couple of particularly ambitious ladies to take the idea and run with it makes this blogger very proud indeed. Check out www.battlestarlocations.com for the most comprehensive centralized source of BSG locations info, with great site pictures and screen shot comparisons. The designers have done their homework, and put in the hours finding sites. They’ve had info directly from the source, BSGs Locations Manager Kent Sponagle, but these ladies have put in the hours in the woods trying to find just the right trees! We tip our hats to them for finally finding one of our most elusive locations – where Laura’s dream sequence from “Flesh & Bone” was shot. Turns out it’s in Robert Burnaby Park in nearby Burnaby, BC. We’ve already scheduled a Locations Scouting Mission to head out and confirm their find! 13th Colony will continue to explore new locations and produce new video files (Yes, we know you’re waiting! We’ve got several more episodes shot and waiting in post-production.) and we’re thrilled to be able to share all that with the new Battlestar Locations website. Congratulations to Anne & Mo. Job well done. So say we all! You are currently browsing the archives for the Caprica category.